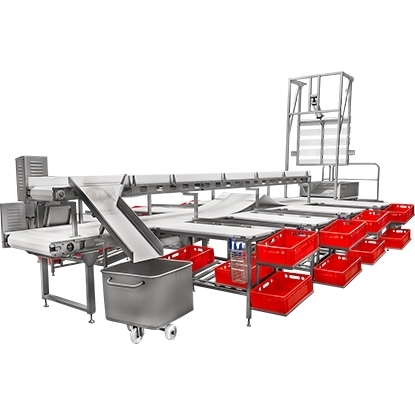 Nieros automated conveyor systems are made from top-end materials and adapted for use in all industry branches. The production of various materials and products demands high-quality material handling conveyors, especially if that concerns the production of hazardous substances, active ingredients, auxiliary materials and raw materials. Our belt conveyor systems and flexible conveyor systems are designed for handling bulk and packaging materials, which are subject to special storage conditions. Nieros industrial conveyor systems can optimize your production and prepare your products for storage and distribution. In doing so, we ensure compliance with national and international regulations and laws and offer you the maximum security for your products. With more than 200 years of experience and decades of field work in almost all application we can truly claim to provide competent and above all reliable advice and problem solving. Our competences enable us to provide professional coverage of the segments problem analysis and conception. We guarantee a comprehensive approach, which takes into account your individual requirement and offers a tailor-made solution. A first overview of our product areas can be found on our website. If you need a product which should be tailored to your requirements, please contact us!